I have ordered several of these over the years, and they are always beautifully done and very well received because they are personal and unusual. The ohhhs and ahhhs and "How did you do that?!?" are a testimony to how special they are. Thank you for such a treasured gift. are all put in storage, so I cannot complete your survey. My only complaint is the paper that is used. Depending on the photo that is used the colors don't show up good. I do love the ornaments to have as a keepsake of my grandkids. I'm sure I will order more. I also give them to the parents & the other grandparents as gifts. The ornament is just the right size, looks to be of high quality and looks great on the tree. Just what I had expected. I ordered 10 of these as presents. I am sorry I did not order more they were beautiful & unique . Mine were all perfect. the image is see through but thats what I really loved about it . I am ordering more for Bridal shower gifts. They are really cute. Have done several. I have seven grandchildern and each has a Christmas tree at my house. I love putting things on their tree that means something. 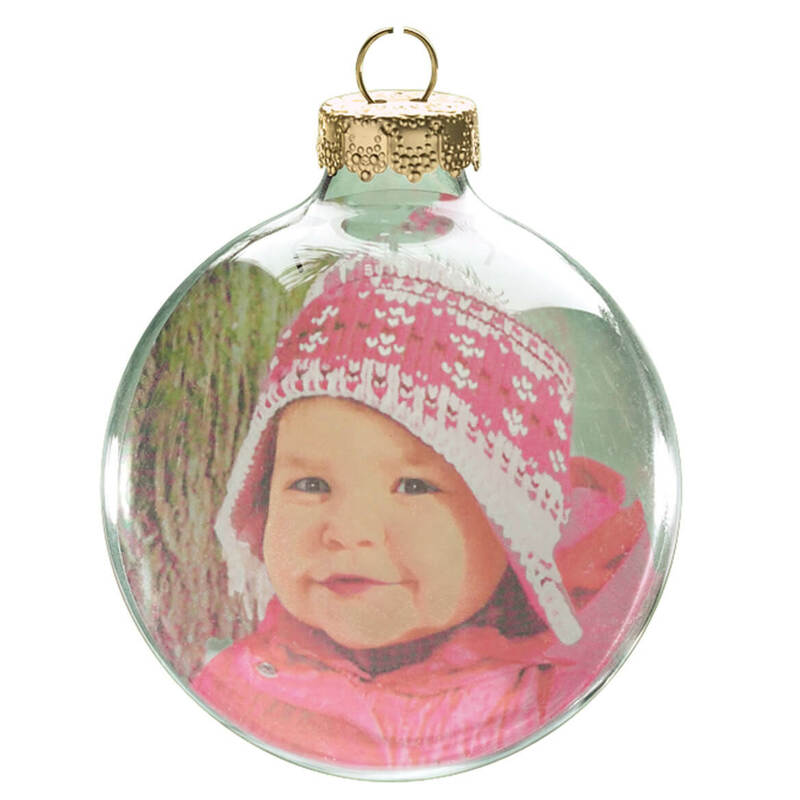 The Glass Photo Ball Ornament is a very unique and wonderful keepsake to display at Christmas. Also the company returned the orginial photo in a very secure envelope as they had promised. Very pleased. Two of these were purchased as Christmas presents, picture was of the bride and groom at a wedding this past summer. Loved the outcome of the photo ball. Can't wait to hear how the the gift was received by the bride & groom and the bride's parents. I ordered three of these this year - all for different family members and with different photos. All were a hit, and will continue to bring wonderful memories in the years to come as they are placed on the Christmas tree. Something families can share with loved ones folr years. Someone gave my mother one of these ornaments years ago containing a picture of our beloved but now gone dog. Last Christmas my nephew dropped and shattered it. My mothe cried as she cleaned it up. I searched for months to find any retailer who could replicate this ornament. I finally found it on Miles Kimball and was overjoyed. I ordered several with many different pictures inside. It is a lovely addition to any tree and to any ornament collection. I love the way these ornaments capture memories. It took me a while to select five grandchildren's pictures with the pixels required to order. I stuck with it & I smiled as I opened each one when they arrived. I think they will be one of the favorite gifts this year. Wish there was a place for the year on them. The pictures are somewhat faint, but show up nicely with light behind them. I ordered 2of these and was very pleased with each of them. I only wish the year could have been inscribed somehow. The recipients love these but its all in the picture - need a good quality high res image - Facebook images not so great! BUY - YOU WILL LOVE IT! I have purchased this item the last two years for Christmas gifts. They are really nice to put on your tree with pictures of your Grandchildren. Everyone I game them to loved them. Love these as Christmas gifts such a great personal memory. A hit with my grand-daughter! I was disappointed at the size for the price. Also it seemed dull. But it was a hit with grand-daughter and great-grandson. It is a very clever idea but needs to be enhanced some how. This ornament is cute, but not what I expected. From the pictures, it looks like the picture wraps around the ornament. Instead, the picture is placed in the center of the ornament. You can only see the whole picture when looking at the ornament straight-on. It's nice to put loved ones on the tree. The ornaments are see thru so look careful to see images. I ordered 9 of these Christmas ornaments solely by what the example represented. My suggestion would be to include in the instructions that the photo sent must be VERY brillantly colorful or you lose the picture details completely. One of the ornaments was a white cat with black ears, for example, and all that showed up inside the ball was ears and eyes! The colors for all of them are not as sharp as I would have liked them to be to make these really festive for a Christmas tree. You have to angle them just right to see the photo's details. These were really not what I was expecting and I am considering returning some of them. According to the picture in the ad, the baby picture looks very sharp. It actually looks like it's on the face of the ornament. Instead, the picture is on the inside and can hardly be seen. This was a Christmas gift for my son with his daughter's 1st Christmas. I was actually ashamed to send it to him. Christmas ornaments. Cheap, see through picture that is put in the middle of the plastic Christmas ornament. Order # SO108822349 was such a disappointment that I am ashamed to give it as a gift. The pictures were cut so close that even parts of the head was cut off. I have ordered this item three times before an an excellent job was done. In fact two of the pictures I sent were duplicates for a second order and they were done perfectly. It was so bad on the order of 14 that I don't know whether the person who made them was angry at me or someone else or just didn't care about how the product looked. I did call about the pictures after I received an e-mail from Miles Kimball saying they had not received the pictures. That was Monday and they were delivered on Monday. I was told to wait a couple of days and call again so Wednesday that is what I did. Then I was told that if the pictures were lost I could re-send them but I sent in the only copy I had so I called Wednesday afternoon and was told off with emphasis on the fact that I was not your nay customer. I did want to know if the pictures had gotten lost before I went to have surgery. But now the product is so bad that it didn't make any difference. Glass was smokey so you couldn't see picture well. There were smudges all over. The actual product was nothing like the picture in the magazine. I sent a bright picture and the end product was dull and barely visible. It was very disappointing. I don't have a nickname! My original photos were not returned with the order. This item is terrible!! The picture is totally see through. You can even see the piece of metal on the other side of the picture. The picture has no color! I sent a beautiful, full of reds, and whites and all I got was clear. DO NOT recommend to anyone else and the orament is quite small. Poor quality transparency. Would be better if a 2 sided photo on paper. not a good view of my picture. I sent 3 different pictures to purchase 3 bulbs and was very disappointed with all 3 xmas bulbs. The contrast was bad and it's hard to see the picture inside the bulb. All they did was take your picture, cut it and stick it inside the top of the bulb. I would never order this product again. Actually, even though it didn't cost much, it was not worth the money and I'm sorry I ordered it. Ordered in past. The clear glass balls used to have a film on them as if they were old and dirty. The last couple of years I've had better luck with them so you can see the photo more clearly. Fingers crossed, I'll like them. If you have a photo of someone with blonde hair, photo in ornament doesn't turn out too well FYI! We lost a member of the family 3 months ago. I had various pictures of her placed in these ornaments, pictures of her as a baby up to an adult. I gave them to her siblings and they loved them. It is a keepsake memory with a picture seen every year at Christmas. It's a Christmas tradition. Since me and my boyfriend got together, every year I buy a glass ornament with a memorable moment from that year together for the tree. I purchase the same one from Mike Kimball every year and will continue as longs as this ornament is available. Thank you for being a part of our tradition. Merry Christmas! I have an ornament made with my son from 3 years ago. I absolutely love it. My little girl is so beautiful. I need to see her on my tree. Have bought these every year for 5 years, grandchildren love them. I received one and it was so beautiful I wanted to give it to someone else. To save our xmas card for memories and have something that will make grandma smile. Cause its can show a picture in the glass ball. I received 12 family ornaments from a friend and I really liked them. I have been looking for a website to do this, and this was easily the most reasonably priced with still a beautiful product. To remember a loved one who had passed away. Wanted a special ornament of our special new baby to have for years to come.. Looking for a unique Christmas idea that can become a yearly collection for my God Daughter's daughter. 1.Photo embedded. 2. Photo to mark the year for all their years to come. I bought this several years ago and had my great niece and grandsons picture put in it. It is very pretty and very nice to hang on the tree each year. Because of the Personalization and fast service. They always Look Great ! I ordered another one and love it!! Haven't been able to find this product at any other online retailers. Gotten an ornament from here before and loved the results! Wanted to display my new grandson's picture. looks nice in photos. Will order more if it turns out nice. I think, if it i s going to be a really great memory to all in the family, forever. Could I email a picture for this ornament? BEST ANSWER: Thank you for your question. You may email us a photo for the item. Just email the photo to exposures@exposuresonline.com. We hope this information will be of help to you. BEST ANSWER: No, it shows the same picture on both sides. what is the size of the ornament with a picture in it? BEST ANSWER: Thank you for your question. The ornament is 2 5/8"dia. We hope this information will be of help to you. Can you email pictures to be placed on Christmas balls? BEST ANSWER: Thank you for your question. You can email your photos to us at exposures@exposuresonline.com. We hope this information is of help to you. I have no idea because I cannot e-mail pictures anyway. I am not very good at the computer and I retired from teaching before I had to even buy one. I do not believe so. I used a photo and they sent it back to me. What type of personalization do people put on the ornament? BEST ANSWER: I asked this question myself before ordering. There is no personalization so don't click on personalize it! They consider you using your "Personal Photos" AS your "Personalization". They still turn out fantastic. What you're seeing on this photo is the either front or back of this photo ornament though, it does NOT wrap all the way around and the little gold ornament prongs do show. All in all, they still turn out amazing even when using old photos! Just the picture you choose for it. Can writing be placed on ball? (e.g. BEST ANSWER: Thank you for your question. Unfortunately we are unable to put writing on this ornament. We hope this information will be of help to you. Would I be able to place a black and white picture of a ultra sound on the ball? Can I get these by Christmas? BEST ANSWER: Thank you for your question. Yes but you would need to pick the premium shipping option in the shopping cart. We hope this information will be of help to you. How quicly can these ship? BEST ANSWER: Thank you for your question. As the item is personalized, it will now need to be express shipped to have arrive in time for Christmas. 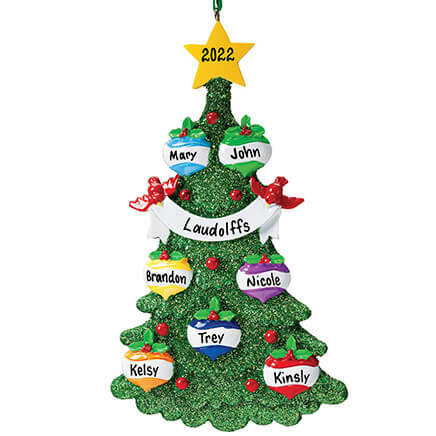 Regular shipping is not guaranteed for Christmas any more for personalized items. We hope this information will be of help to you. is the photo transferred onto the interior of the rounded glass sphere or is this a round photo placed within the middle of a clear glass ball?